We’d love your help. Let us know what’s wrong with this preview of The Stolen Moon by Rachel Searles. The action-packed sequel to The Lost Planet. - His younger sister has an otherworldly (and sometimes annoying) ability. - The starship he now lives on has been infiltrated. - His friend Parker is working on the network hack of a lifetime. - They won't be able to save the world in time. To ask other readers questions about The Stolen Moon, please sign up. In this sequel to THE LOST PLANET, Chase, Parker and his sister Lilli have taken refuge on a Fleet ship captained by family friend Captain Lennard. This isn't a very secure spot because the Fleet is after them. Both Lilli and Chase have unusual powers that Fleet would like to experiment on and exploit. Parker has found some friends and is deep in trying to hack the computer chip that will tell him the location of his mysterious guardian Asa Kaplan. Lilli is hiding and sending duplicates all ove In this sequel to THE LOST PLANET, Chase, Parker and his sister Lilli have taken refuge on a Fleet ship captained by family friend Captain Lennard. This isn't a very secure spot because the Fleet is after them. Both Lilli and Chase have unusual powers that Fleet would like to experiment on and exploit. Parker has found some friends and is deep in trying to hack the computer chip that will tell him the location of his mysterious guardian Asa Kaplan. Lilli is hiding and sending duplicates all over the ship. And Chase is wandering aimlessly. Between his amnesia and confusion about his ability to phase, he is one confused young man. The kids find themselves in the middle of a war. The Storrians hired the Werikosi to terraform and moon and now the Werikosi don't want to leave. The Fleet has sent Lennard's ship their with a bunch of diplomats to try to settle the situation down. The kids find themselves on the moon that is in dispute and in danger from both the alien groups and from the Fleet which is trying to destroy Lennard's ship. They reconnect with Asa Kaplan and learn some things about their parents that help explain why they are in their current situation. Kaplan wants them to leave with him to get away from the Fleet but Lilli demands that they stay with the Captain who is a family friend rather than go off with a stranger they barely know. I’m so glad I started the new year off right by reading The Stolen Moon. I’ve been eagerly anticipating this sequel ever since I devoured its predecessor, The Lost Planet, in one sitting last January. Well, I loved this installment even more. There are scenes of breathtaking action, as well as heart aching tenderness, against the backdrop of an ever expanding and politically complex universe. More please and thank you! 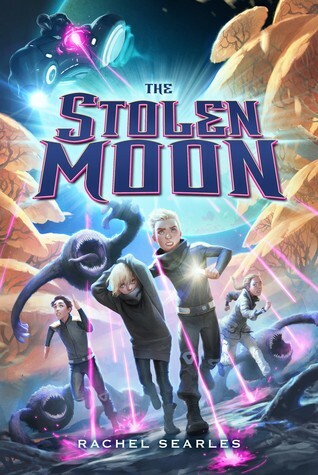 Seriously excellent middle grade fiction and just some of the most fun on a sc I’m so glad I started the new year off right by reading The Stolen Moon. I’ve been eagerly anticipating this sequel ever since I devoured its predecessor, The Lost Planet, in one sitting last January. Well, I loved this installment even more. There are scenes of breathtaking action, as well as heart aching tenderness, against the backdrop of an ever expanding and politically complex universe. More please and thank you! this book was very good because it has a lot of action and thrill to go with it. It has humans who face conflicts but as friends they are able to overcome these obstacles. P.S the humans in this book have super powers that help them beat the villian.- His younger sister has an otherworldly (and sometimes annoying) ability." The starship he now lives on has been infiltrated"." His friend Parker is working on the network hack of a lifetime". I liked this one even more than the first. Lots of action, great introduction to adventurous science fiction for middle grade readers. Chase and his younger sister Lilli have special abilities, but they don’t know why. It might have something to do with their parents, who they have heard might be alive but have always been told they were killed. They are safe for now, and so is their secret, aboard the spaceship of Captain Lennard. Then the ship becomes involved in an inter-planetary moon dispute and things turn ugly, including a crash landing and capture! Chase still wants to know about his parents and his abilities, but protecting his younger but they are caught in the middle of a very dangerous set of circumstances. This book is complex, political, and fast paced. There just wasn’t enough descriptions of aliens, people and places to allow my imagination any foot hold to get into the story. I felt like I was just reading words. There were very few spaces to get to know the characters between dangerous and complex situations. I enjoyed the first book, it still had a sense of mischief, but this one was just overly long and it lost all intrigue for me. Readers may want to read this second book if they liked the first. This review has been hidden because it contains spoilers. To view it, click here. Book is great. Has a GREAT plot and theme. This book is a continuation off the book called The Lost Planet and if you haven't read it, read it NOW! Anyway, this book starts off 3 months from the end of the first book. He has learned the mystery of his amnesia and is now with his sister aboard the Kuyydestor. They have built themselves a life aboard it but when everything goes south nothing goes right for them. I NEED the third book now!!! Too bad it doesn't exist yet. I'm just so glad that I read this book right now. Because I adored it. And it was just what I needed. A few small things bothered me a little, but so much made me happy. I'm giving this book a four star, because I really adored it. I didn't hate anything, but felt like there could have been a little bit more. Sigh. I'm not sure how to talk about this book. It is an amazing sequel. And the characters are just all kinds of adorable. The writing is amazing. The story is exciting and surprising. I won't talk too much about the plot, but there are some things I want to mention. Most of this book takes place inside a huge spaceship, which I mostly loved. We also learn that Chase just turned thirteen, which is almost two years younger than Parker. It bothered me a little bit, but then, not really, because Chase is still all kinds of awesome, despite being a bit young :) I loved that the book is told from his point of view. As I think Chase is an amazing character and I loved getting to know him a bit more in this book. And to know more of his phasing. There are so many awesome characters in this book. As I said, I adored Chase. And we get to see more of his sister, Lilli, as well. Whom I do like, for the most part. Wishing she didn't lie so much. Hmph. But I loved reading more about how she can sort of teleport. It was all kinds of interesting. I also loved getting to read more of Maurus, as I think he is an awesome character. Vidal and Derrick were also pretty interesting to read about. I'm still unsure about Asa Kaplan. Hmph. But curious to know more. Then there is Parker. I adored him the most in the previous book, and I'm pretty sure I did that now too. Okay, I do love Chase more than anyone, but Parker is just all kinds of amazing. Wishing he had been a little bit kinder to Chase at times, but I also love how he worries for him. And ack. I just adore their friendship and I really hope to get to see more of that in another book. Pretty please. I'm also curious to know more about Parker; what he is meant to do. I also felt so sorry for him at one point. It was sad. I really loved The Stolen Moon. It was an excellent sequel. The characters are all kinds of amazing, and the plot is very exciting. I cannot wait to read more from this amazing world Rachel has created. Crossing all my fingers there will be more books about Chase and Parker. <3 I need and want more so badly. Sigh. This book was just all kinds of awesome. And I'm so glad I'm reading this series. Hoping there will be more. As I adore Chase and Parker so much and I'm dying to know what happens next. I'm not going to say much more about The Stolen Moon; just that it was all kinds of amazing. And I loved it a whole lot. There are a lot of space things, and we get to see a few new planets as well. But aack. That ending. It is mean. I need to know more. Sigh. There are a lot of death in this book as well. Which was actually kind of sad. Sniffs. But also really well done. There is so much happening in this book. And I enjoyed reading about all of it. Just wishing it had been a lot longer; I did not want this book to end. In the sequel to The Lost Planet, Chase is still in hiding, protected by a family friend on a space ship. To everyone else, he is just an orphan recruit, but Chase and his sister are so much more than that. Following a series of clues, the children, along with their friends Parker and Marcus, set out to find the truth even if it means disobeying a direct command. How could they know they were walking into the middle of a war? How could they know that they enemy will do anything, even commit genocide, in order to get at their extraordinary escapees? The reason I even read The Lost Planet was because this book sounded so interesting. It did not disappoint. One of my major issues with the last book was an extreme lack of answers, a problem that is solved in this volume. There is a lot of action/adventure type thing going on with kids who are willfully out of their element, which makes the story both interesting and infuriating in the same breath. Searles does a great job of keeping the pace moving along at a brisk pace without being overwhelming. Of course, as with all things, there are still unanswered questions that will be revealed in another book, but enough mysteries were revealed that I wasn't frustrated. A solid sci-fi for middle grade readers with just enough mystery to keep you wanting more. Starting this off, it's been waaaaaaaay to long since I read The Lost Planet. I pretty much saw this book on the shelves next to it, remembered I'd read the first, and decided to give the sequel a try. Man. Good choice, Thomas. The Stolen Moon is fast paced, and is 'out of this world'. It is as good as I remember the first book to be. This book stresses the importance of trust, friendship (as cheesy as it sounds), and determination. Chase and Lilli's abilities added an extra flavor to the sto Wow. The Stolen Moon is fast paced, and is 'out of this world'. It is as good as I remember the first book to be. This book stresses the importance of trust, friendship (as cheesy as it sounds), and determination. Chase and Lilli's abilities added an extra flavor to the story. Lilli was awesome; (view spoiler)[I loved the way she was able to acquire everyone's full attention with a single statement. Her duplicating ability has so much potential... (hide spoiler)]Though, Parker was my favorite character. This guy's computer abilities are amazing! He is legitimately underestimated. I remember this intergalactic space world, and the author truly does bring it to life. All in all, a good read. Asa... Dang... That betrayal was harsh. I can't stand that such an interesting character to be put off because Chase betrayed him once... If there's a sequel, this guy better be in it. wow! so many adventures, battles, and sacrifices and still so many loose ends. I want to keep reading and know what will happen with Chace, Parker, Lilli and Marcous.... I wonder what Asa Kaplan will do next. will he help them again after they refused to go with him? I think this series will be a great hit among my students. This is the sequel to Lost Planet. Very good science fiction space opera adventures, with lots of spaceships, traveling to different planets, moons, etc. ; and lots of extra-terrestrial beings, both good and bad. Also, lots of territorial conflicts and political conflicts; but without a lot of boring bits. So good! I definitely saw the Star Trek inspiration in this one, more so than the first. Why can't there be more sci-fi young reader series like this? Now I have to wait for the next book in the series. That'll be annoying. But I have faith in Rachel Searles to bring brilliance to young sci-fi fans again. Absolutely love her writing style and the action/suspense. The book is a fun action packed sequel to the Lost Planet. The story picks up right where the first one left off. There is not a dull moment in the book as Chase, Parker, and Lillian try to figure out what they are and what is happening. Students who loved the Lost Planet will love this book as well. I want to read the 3rd book in the series now to see what happens next. Just as amazing as the first book, but even more so! all sorts of questions answered, and new ones presented. this high action adventure will keep you at the edge of your seat, i can't wait for the third one!! I can't even describe how great i thought this book was, i only wish i had read them both sooner. I take it back. Impulsive, reckless teenagers just saved their lives. From that moment in the book where they were impulsive, it went from a four-star book to a five-star one. It was nail-biting until the end, and I still feel breathless. The third book can't come out fast enough for me. I really liked it. And the cover for this one is GORGEOUS. But why oh why did it have to end that way?? Great sequel; loved the ending. This book was a delight to read. It really kept my interest and I really enjoyed the characters. I can't wait for the next book. I won this book on goodreads. I really like this book a lot. It's quite long, but also really awesome and really leaves you hanging. I highly recommend this book for 6-9th graders. I wonder how many books this series will end up with. Not quite as good as the last one but I want to see where it goes.